Art Making and Studio Spaces is a visual studio tour, an opportunity to turn the key and discover the inner workings of artists in their ultra-personal, unique workspaces. The mission of the book is to look inside studios in progress, amidst the throes of the artmaking process, and to investigate the thoughts of the artists within. 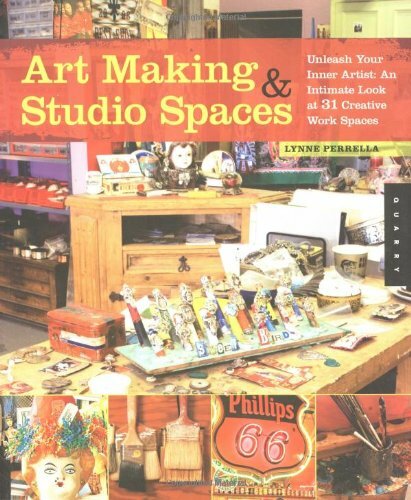 This book reveals the interplay between artist and studio, and explores how each workspace reflects a different, distinctive creative journey. Photography by Sarah Blodgett, plus contributed photos by some of the artists, combines with personal insights to provide an incomparable studio tour that will inspire you to create your own private work space. Pages from Lynne Perrella’s art journal are included, to give further insight into this bottomless topic of "art and where it happens."